2014 STEPHEN KING DESK CALENDAR - SMALL TOWNS OF STEPHEN KING. The theme of the 2014 calendar is the "small towns" created by Stephen King that had unexpectedly big things happen! 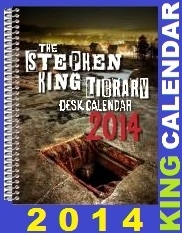 OVERVIEW: Welcome to the Stephen King Library Desk Calendar 2014. This year, we celebrate the small towns made famous by the Master of Horror. Places where big things—unexpected things—happen. Just why are these seemingly safe havens such breeding grounds for evil anyway? Numerous essays on a variety of King-related topics, including.. The misery of being trapped in a small town. Trivia buffs will enjoy the challenge of the quizzes, from "Name That Town!" to which King wrote what in "All in the Family." The calendar is functional as well as informative, with plenty of space for jotting down notes, entering appointments and recording special dates. The Stephen King Desk Calendars have been very popular here at the Overlook with our readers. It's especially been a great gift for friends and family to give. 2014 October. Hardcover, spiral bound, 128 pages. Product Dimensions: 7.5 x 10.0 x 1.0inches.